All companies are looking for growth. Pharma companies are no different and yet in this historically profitable sector, growth has become more challenging. 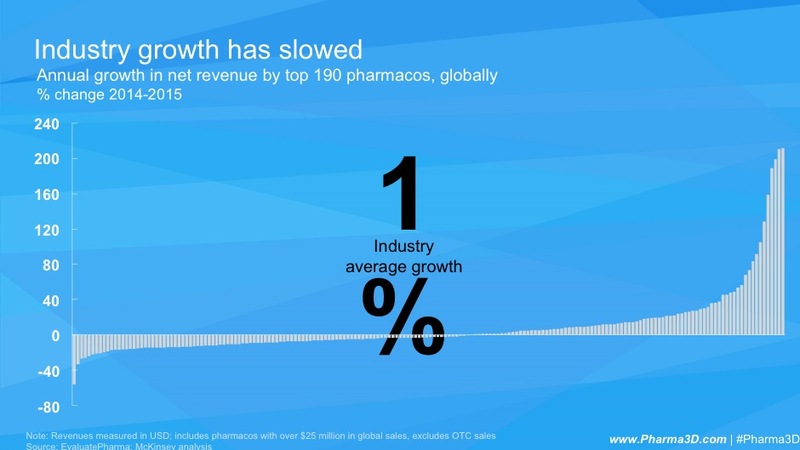 An analysis by consulting firm McKinsey found that in 2015, 56% of pharma companies saw declines in net revenues globally, and the industry as a whole grew at a mere 1% (Figure 1). Declining R&D productivity and narrow pipelines are often cited as the culprit, but many companies have refreshed their pipelines, and 2015 saw a historic number of new products approved by the FDA. So while technical strategies have remained robust and innovative, commercial strategies, by comparison, have not undergone a comparable level of change (despite major changes in how patients and health care providers make decisions). In fact, from 2013 to 2014 pharma firms spent the same amount on detailing while cutting a billion dollars from the rest of the commercial mix. To revive growth and capture the full potential of these new pipelines, pharma companies must revitalize their commercial strategies with the same level of diligence and urgency that they brought to their pipelines. Patients and their health care providers now access and share information, communicate, collaborate and connect with one another fundamentally differently than they did in the past. Today, according to a Decision Resources Group study, 70% of people search online when experiencing a symptom, as do an equal number of HCPs when making a diagnosis. As a result, a Google analysis found that more than 1 in 20 Google searches are now health-related — a number that has increased more than 15% each year since 2011 and is unlikely to slow. Today’s patients act as true health care consumers, researching and weighing the effectiveness and value of new therapies by integrating views from many different sources. HCPs are also demanding better, more actionable information on therapies and services that translate into value for them and, more importantly, their patients. Despite these dramatic shifts and the massive growth in health-oriented digital activity, most pharma companies have struggled to update their commercial strategies and practices in response. We wrote Pharma 3D: Rewriting the Script for Marketing in the Digital Age with one purpose in mind — to help pharma companies adapt to this new reality. In it, we draw lessons from industries ranging from fashion to entertainment to financial services on how they transitioned to fully integrate digital and non-digital engagement with their customers. Across industries, these innovative commercial leaders now “think in 3D,” meaning they have reengineered how they discover the moments that matter most to their customers’ decision-making (in pharma, both patients and providers); they employ these insights to design customer experiences that align content, messages and media to build genuine relationships with their stakeholders; and they deliver these experiences well using a test-and-learn approach to continuously improve. To think in 3D, pharma companies will need to radically change their business processes, supporting systems and technologies and, in some cases, their fundamental beliefs about what drives commercial performance. For example, while most pharma companies currently invest heavily in survey-based market research, these insights can be significantly enriched when combined with regularly refreshed data on actual patient or prescriber behaviors and actions. Doing so can reveal the “micro-moments” when people realize that they need to know, discuss or seek guidance. 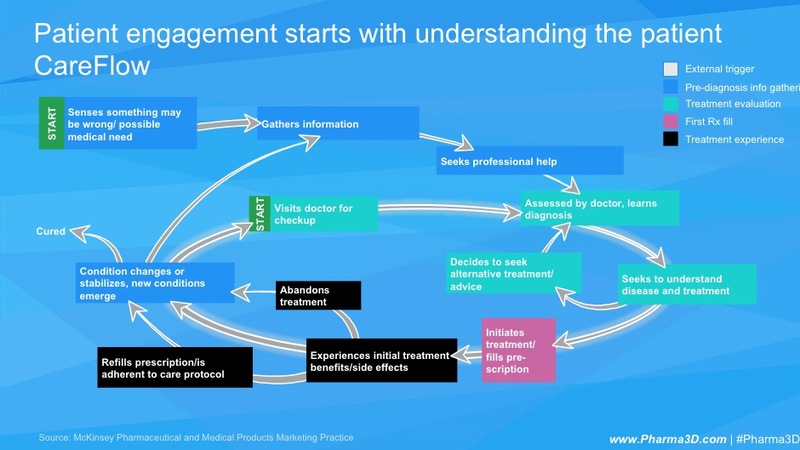 When you collect all of a patient or HCP’s micro-moments, they form a CareFlow (see Figure 2), which is a depiction of the sequence and interactions between all the critical moments in the cycle of a person’s care. Understanding and disentangling the complexity of this cycle is important because each moment is not an independent event; each is shaped by all the prior experiences that person had. For example, the primary concerns of patients suffering from psoriasis could range from understanding treatment options and relative effectiveness, to managing the difficulty of ongoing therapy, to anticipating and resolving the lifestyle challenges severe psoriasis can present. A provider’s approach to these patients will reflect their differences, as should commercial tactics targeted at those with the condition. The best marketing opportunities often come from addressing common drivers that affect multiple moments. Those insights only emerge when events are looked at as a system. Additionally, many marketers discover, when evaluating the relative importance of different points along the CareFlow, that they can improve performance by reallocating spend and effort in one or more ways. With a solid understanding of the patient and HCP decision process, marketers can select the most attractive segments of patients and HCPs to market to and develop “personas” (a concept borrowed from the world of design and leading retailers and consumer goods manufacturers) for each key segment. These personas shape the content strategy that the company pursues and the experiences it creates (i.e., everything ranging from patient services offered to co-pay strategies to support for online patient or HCP communities). Across all of these activities, it is important that the pharma company have a truly generous orientation — one that is interested first in the priorities of the patient or HCP rather than the priorities of the company. To resonate with today’s patient or HCP, experiences with a company must feel personal, authentic and transparent as well as be consistent across interactions and genuinely engaging. The company must also demonstrate an openness to feedback and the willingness to have a two-way dialogue with the people it serves. Delivering on that vision will require dramatic change for most pharma companies. Company functions will effectively need to learn to work together in a new way, and commit to transforming their relationships with patients and physicians end-to-end. Teams will need to fundamentally rethink processes to enable the “test and learn” approach that digital-first firms like Google and Amazon have proven outperform the “set it and forget it” commercial planning and execution cycles that predominate the pharma industry today. Leading this change is a significant undertaking, but one that can be managed effectively with a clear and compelling vision, the right role models, and thoughtfully re-crafted systems, capabilities and operating processes. Making these changes is well worth it (implicitly, not making them will be increasingly problematic). McKinsey research has found that companies with advanced digital capabilities grow revenues twice as fast as peers and deliver 25% greater total returns to shareholders annually. Given the scale of that opportunity, if pharma companies embrace the revitalization of their commercial models with the same vigor they have pursued the refreshing of their R&D pipelines, the future growth trajectory for the industry will look very bright.